Reader Rant: The Case of the Shrinking Park : Where Is the Park Promised to Mission Beach in New Large Development at Former School Site? On Tuesday, May 14th, the San Diego Unified School District board authorized the sale of the former Mission Beach Elementary School property to private developers – despite objections by Mayor Filner, residents and community activists. The 4 to 1 vote by the Board was the culmination of the process to cement the controversial sale of 2.23 acres of prime public school land, a half block from the Pacific Ocean and mere yards from Mission Bay. Mayor Filner, community planners and civic activists, as well as residents pleaded with the Board to keep the land in the public arena, and work with either the City or developers on alternatives. The site was sold for $18.5 million to duo of developers, doing business as McKellar-Ashbrook LLC, registered in La Jolla. Now, the current developers have proposed a major development for the site, and have worked out an arrangement with the city to also put in a park. The community of Mission Beach was first told that the park would be almost one-third acre. However, now, under changes, the so-called park has shrunk by a third or almost 40% depending on what formula is used. The community also has other problems with the proposed development. To express the frustrations that Mission Beach residents have had, Mike Meyers (a pseudonym for a South Mission Beach resident) has written a “Reader’s Rant” and we publish it here below with some editing for clarity. Voting by San Diego Planning Commission and City Council will be within the next two months. The elementary school closed in 1973 to students. It has been used by the school district as instructional coaching to teachers and as administrative office until 2011. The site will include 20 buildings overall. Each unit will have 3 bedrooms and 2 parking spaces. There are different numbers of units in some of the buildings, there will be 10 buildings with 3 units each. 7 buildings with 4 units each. All the buildings will be 3 stories high at thirty feet. The developers have somehow divided the property which means the city required park has been reduced in their opinion. Plus both parts use the same architect and building style. The northern part call Mission Beach Residences with 51 units and south part is called Santa Barbara Place Residences with 12 units. Green sections on this map are what developers are proposing. The Mission Beach community supports the concept of residential uses for the property. The developers had agreed to follow the same grid in Mission Beach with the COU1ts (sidewalks) and alleys. The Mission Beach community does not support the developers proposal for a required park and the size of the building. The Mission Beach Town Council voted unanimously against the park May 13, 2015. The Mission Beach Planning Group did not have one vote in support of the project at its September 15, 2015 meeting. Green on this map is what the community wants. San Diego City has determined that when a certain size of a new development occurs, a park is required. There is a formula to determine size. The original size of the school property required a park of.35 acres which is 15,246 square feet. After the developers submitted their original first plans for the development, they then divided part of the development within their own entity. This reduced the size of required park to .27 acres as City staff using the formula came up with that amount. But now after Developmental Services and Planning Department used some kind of management magic, the required park was reduce to .201. The developers originally promised a .35 acre population park at the December 12, 2013 San Diego Planning Commission initiation hearing. 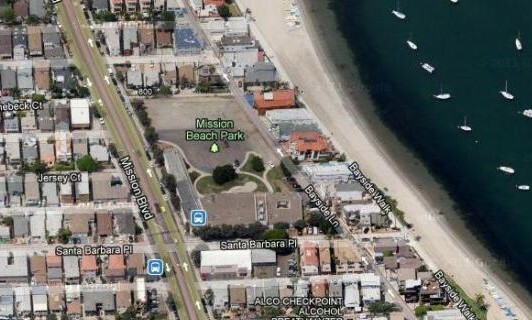 The people of Mission Beach are still asking why the required park for the North part was reduced by 25%. It went from .27 acres to .201. The formula is public information. Plus the formula did not take into account the summer visitors who stay in the houses. The current formula use 1.87 per person per limit. During the summer there is at least four people per unit. Plus there is the need for a pocket park for at all the kids under 10 years old. The park should be even bigger than the formula when adjusted for summer rentals. The park is to be placed along Mission Blvd. You will have 30 feet buildings on one side and parked cars on the other side along Mission Blvd. The park will be 269 feet long (including a 20 foot alley for cars) and average 40 feet wide. It will go from 70 feet wide to 10 feet wide. It will have an alley going thru the park and the court sidewalk also going thru the park. The final design of the park will be made later by the city Park and Recreation. The developer has proposed numerous trees along the buildings and benches plus tables. (Some in the community are afraid the tables will be used by homeless.) With the park this close to Mission Blvd, it will be dangerous for young kids with the possibility of running into the street, along with all the car fumes, to play next to Mission Blvd. There is a petition that has been signed by over 600 Mission Beach residence that states they want the park on Santa Barbara Place. The size of that area is .34 acres which is almost the required formula size of.35 acres. One big reason is the mature Ficus tree. There is a dispute over whether the tree can survive. But the placement of park would allow the park to be 80 feet wide instead of 10 to 70 feet wide and would not all be next to Mission Blvd. Like the developer proposed park. Original formula for the whole development park (before the partition) was .35 acre=15,246 square feet= 6.35 lots (30xSO feet); (30×80 feet is the normal lot size in that area). 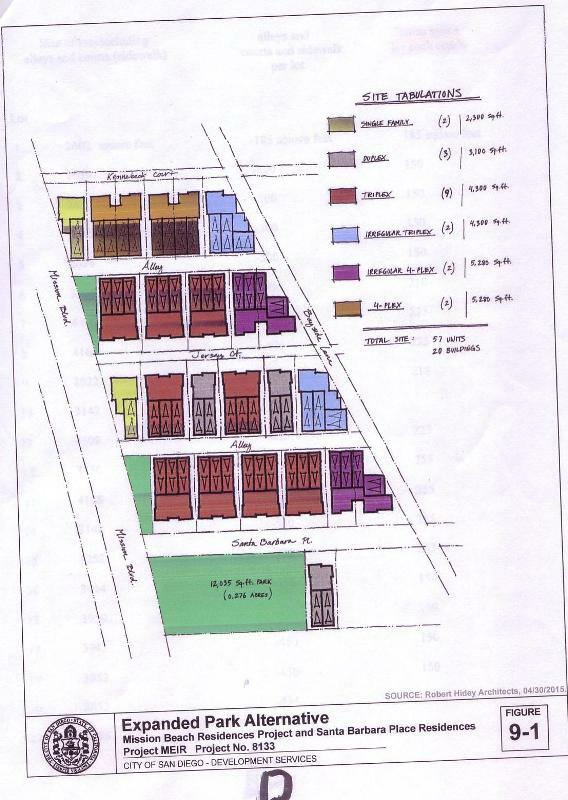 Development Service management figure of north development .2013 acre=3.65 lots (30×80 feet). As you can see by the numbers, the developer – by segregating off part of the school development – and the city Developmental Service management have lowered the park requirement, and have reduced the required park almost in half. The Mission Beach Planning Group and the community has a problem with the location and size of the park. But it also had a major problems with the size of each condo and the actual size and location of the buildings. The original Mission Beach plot map design by the John Spreckels back in the 1914 includes standard small lots 25 feet by 50 feet in North Mission from Santa Clara Place to Pacific Beach Drive. Other standard lots in the rest of Mission Beach are 30 feet by 80 feet. Corner lots on Oceanfront Walk and Bayside Walk and corner lot on the end of courts are allowed to be a little bit larger. Since 1979 when the Mission Beach Plan District Ordinance was approved, it has been very rare to find triplexes and fourplexes inside the Courts or Places. This development’s first plans submitted to the city were mainly duplexes on the court. The current developer’s building plans are now mostly bulky buildings three and four unit buildings that do not fit the character of the community. But another main problem with the bulk of the buildings is size of the individual condos. With shapes of the individual lots in the community it is hard to fit the number of parking spaces with bedrooms. So the size of allowable living space is limited to 1.1 square feet times the lot size. Two parking spaces are required per unit. The standard typical 30 foot by 80 foot lot allows 2640 square feet of living space which will allow two 3 bedroom unit and four parking spaces. Thus each condo would average 1320. They could be different size but that is the average size. This is where the Mission Beach Planning Board has major problem with the developers. The developers are going to count the alleys and sidewalks as part of the lot size. They are calling the alley and courts (sidewalk) private and allowing public access. Nobody has ever done this. This allows the developers to build an extra 150 to 225 square feet in each condo. Which will probably later be converted into extra bedrooms without parking spaces by the subsequent buyers. The developers are proposing a Planned Development which is not allowed under the Mission Beach PDO. 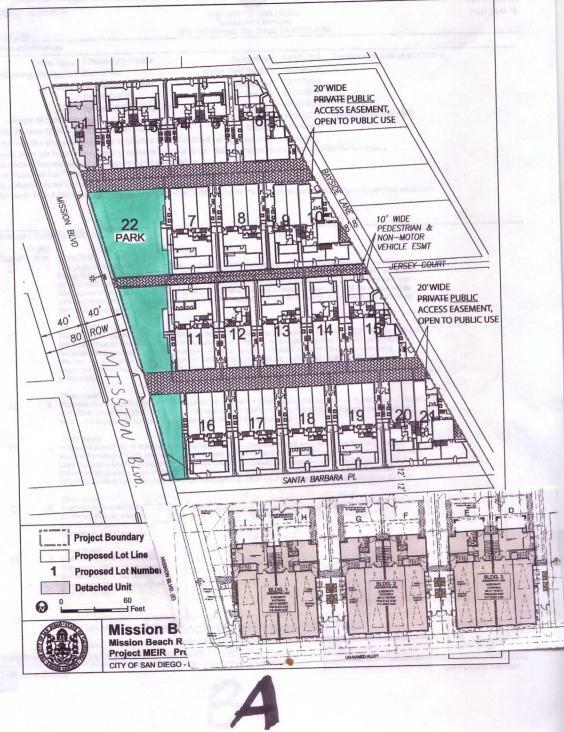 The developers are trying to subdivide the project to violate the required standard lot sizes of historic Mission Beach. These individual condos have only two parking spaces for the 3 bedroom units. This will already strain the parking problem in Mission Beach. This makes it difficult to find parking spaces on the street during the week. Plus it restrict the rest of San Diego because parking will over flow onto the parking lots. This will create more of a traffic problem as people drive around looking for parking spaces on the weekends. Thus, all of San Diego is being denied access to use of the beach by Developmental Services allowing the building to be built bigger than any other condo that has been built in Mission Beach since 1979. The community has the opposite feeling on those thoughts. The developer states that some college people do not drive and will not need parking. However the trend observed lately are that units are having more than one person per bedroom because the rents have gotten so high. So now there are three people in a two bedroom and four people in a three bedroom. So the parking is getting worse. The developers have hired four lobbyists firms. They are Peterson & Price APC; Leppert Engineering Corporation; Atlantis Group; Allen Matkins Leck Gamble Mallory & Natsis, LLP; and on the other south property using the same architect and mailing address is Atlantis Group again. But some of the answers we are still waiting for.What happens to the current 38 parking spaces who are now using the school property? The traffic study was done in February and March. Not only was the traffic study done during the winter, there is no mention of summer weekend traffic jams on West Mission Bay Drive in the draft EIR. The draft EIR stated the development would have an effect on the intersection at the roller coaster. Where is the mitigation. The report was done in February where the cycle was 45 seconds. The development would take it just under the requirement of mitigation. Problems at that intersection on a weekday in the summer, the cycle is 2 minutes and 30 seconds. It is an F intersection. Mitigation is required. Also how will the development affect Mission Blvd one lane traffic. Will the additional bedrooms with more than two cars per unit affect parking and traffic looking for spaces? In October 2015, four members of the community met with Councilwoman Laurie Zapf. They tried to explain the major problem the community had with the development. But the reports coming back to the community indicate that she was wholly agreeing with the developer’s talking points. This sounds like a repeat of Clairemont in 2014, where she favored relaxing the height around the transit-oriented development, then later changed her mind according to the OB Rag May 2, 2014. Mission Beach has 600 signatures on a petition to save the Ficus tree, the Mission Beach Town Council unanimously opposed the location of the required park, City staff required a larger park, and the Mission Beach Planning Board did not get any votes in favor of the current proposed development, including its so called park. The question is why is Councilperson Zapf not supporting the community wishes in Mission Beach? She appears totally unconcerned with this project violating the Mission Beach Planned District Ordinance and the City of San Diego Land Development Code. Ms. Zapf – who opposed 2014 Clairemont project and was in total opposition to their communities’ wishes, now is opposing the Mission Beach community and its wishes. The community is not against the project. Build the condos to the maximum allowed under the Mission Beach PDO without using the alleys and courts to gain additional square footage. Move the park to Santa Barbara Place so it can be used as a park and not a bunch of tables for the homeless. Plus create a park that a 5 year old can use and not worry about running into the street. The mayor in his state of the city speech called out for more parks in the city. This proposed park is more of a landscape buffer zone for the development than a park that can be used by the community. Councilperson Zapf on Voice of San Diego in its January 16 podcast said she is striving for parks for children. She needs to start in this development and move the park away from Mission Blvd. Interesting. However, I don’t understand the concern over the tables attracting the homeless. They literally sleep on the beautiful green spaces along the boardwalk and the City seems to do absolutely nothing about it. There are no tables there, but there are plenty of homeless sleeping & hanging out there. I don’t want to seem harsh with these statements but there are plenty of services to help these people, but it seems they just don’t want them. Good luck in the fight against the development. While I haven’t studied the details of the formulas involved in this case, I can tell you that developers are usually far smarter than the City when it comes to these matters. Anytime government puts rules in place, they should hire the best consultants from the business community to pick them apart and find the “loopholes” in the rules before they are put in place. Older Article: Want to Know How Much Water Your Neighbors Use?